Come see us in the warm waters of Mexico starting in December 2015! 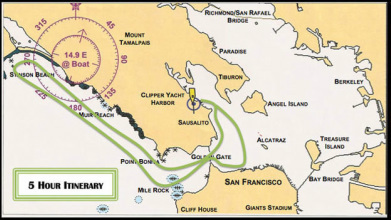 Our sailboat, the Hasty Heart, captains, and crew offer a comfortable, safe, and fun SF Bay adventure to passengers with all levels of sailing experience. 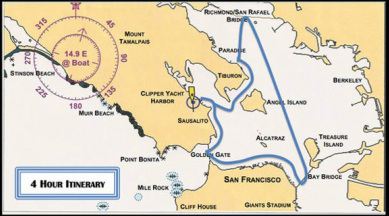 The San Francisco Bay has a variety of micro climates we can take advantage of to customize your charter. Thrill-seekers enjoy sailing under the Golden Gate Bridge, continuing on out into the Pacific to surf the ocean swells and bury the rail, then spinnaker sail back into the bay. Warmth-seekers enjoy floating in the tranquil lee of Angel Island and a light wind sail towards the San Pablo Bay. SF Bay sailors seeking both leisure and adventure enjoy the calm sail along the San Francisco city front with a brisk return across the Bay. All of the above with the possibility of using the spinnaker and continuing along the city front to the Bay Bridge and Treasure Island. You can do it all including McCovey Cove at Giants Stadium, around Treasure Island, Angel Island, and pass under all three Bay Bridges. Or, you can ocean sail North past Muir Woods & Stinson Beach. We are committed to making every charter aboard Hasty Heart special. Let us help you plan the details. Accommodations welcome. The rates below are for hourly six-pack or bareboat charters. Rates for full-day, overnight, & multi-day charters vary. Food, captain, & crew included.